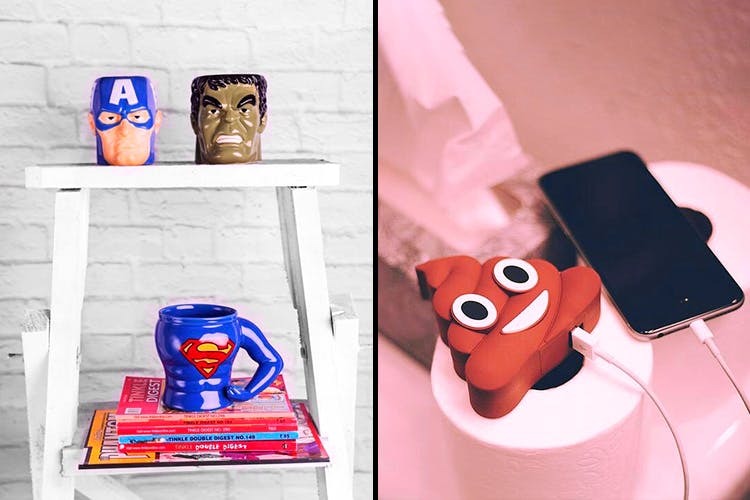 Beyond Ordinary is a company that offers unique gifting options, funky home decor items, gadgets and more that we’d like to get our hands on ASAP. Impulse buys, offbeat and personalised gifts. Love websites and stores that stock the most unusual and extraordinary items? Beyond Ordinary will make you terribly happy. This company’s got gifts for every kind of individual. If you’re a liquor connoisseur (or have a friend who is one), Beyond Ordinary’s got the coolest bar accessories and games for you—the drinking bingo and drunken Jenga, Batman ice trays, the skull-shaped and rainbow-coloured glasses are just some of their fantastic options.Marvel or DC fans, give your phone a superhero companion with their power banks–they've got shapes like Batman and Deadpool faces, Captain America's shield, and Iron Man's head. We have to say, their gadget range looks great–because who doesn't want a set of speakers with a dancing water fountain in it? You'll also find brightly coloured stationery–including wooden pens, panda pencils and even a 3D printing pen for when you want to bring your art to life. The kids in the house will definitely love the emoji mugs and bottles! The pricing for some products could be much lower than what it currently is. Their health and fitness range doesn't look so great, either. They also do customised products, specially for weddings (bride squad caps, hip flasks with your name on it and more)—you can get in touch with them through their website or Insta/FB page for more details.